Spraffl allows you to post ANONYMOUS, location-based messages wherever you are in the world open to everyone around you to read and comment. 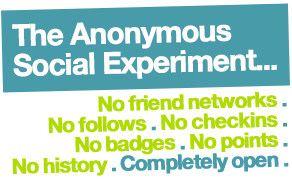 Unlike all the other social networking apps, there are no friend networks to build, no people to follow, no checkins required and no badges or points. Spraffl is completely open – just fire straight in and start Spraffing wherever you are in the world.